Anthony Michael Lazzeri (December 6, 1903 – August 6, 1946) was an Italian-American professional baseball second baseman during the 1920s and 1930s, predominantly with the New York Yankees of Major League Baseball. He was part of the famed "Murderers' Row" Yankee batting lineup of the late 1920s (most notably the legendary 1927 team), along with Babe Ruth, Lou Gehrig, and Bob Meusel. Lazzeri is one of only 14 major league baseball players to hit for the natural cycle (hitting a single, double, triple and home run in sequence) and the only player to complete a natural cycle with a grand slam. He also holds the American League record for the most RBI in a single game, with 11 on May 24, 1936. In that same 1936 game, he became the first major league player to hit two grand slams in one game. Lazzeri was posthumously inducted into the National Baseball Hall of Fame by the Veterans Committee in 1991. At age 15, Lazzeri was expelled from school. He began to work with his father, earning $4.50 a day ($75 in current dollar terms). Lazzeri also played semi-professional baseball and trained to become a prizefighter. A friend of Lazzeri convinced Duffy Lewis, who managed the Salt Lake City Bees of the Pacific Coast League (PCL), to allow Lazzeri to tryout for the team in 1922. Lazzeri made the team, earning $250 a month ($3,742 in current dollar terms) as a utility infielder. He batted .192 in 45 games, and was demoted to the Peoria Tractors of the Illinois–Indiana–Iowa League in 1923 to gain more experience. After the 1925 season, Barrow purchased Lazzeri from Salt Lake City in exchange for the rights to Frank Zoeller and Mack Hillis and $50,000 ($714,326 in current dollar terms). Lazzeri signed a contract with the Yankees worth $5,000 ($71,433 in current dollar terms). With the 1927 Yankees, known as "Murderer's Row" due to the strength of their batting lineup, Lazzeri batted .309 with 18 home runs and 102 RBIs. He finished third in the AL in home runs, behind only teammates Ruth and Lou Gehrig. The Yankees finished the season with a 110–44 win-loss record, and defeated the Pittsburgh Pirates in the 1927 World Series. Baseball experts solicited by Billy Evans named Lazzeri the consensus best second baseman in the AL. He suffered a muscle injury that threatened to end his season. Nevertheless, Lazzeri returned to the team, and hit a key double off of Alexander in the 1928 World Series, which the Yankees won. 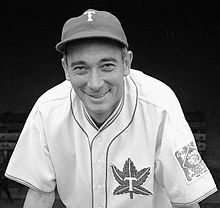 Despite the games he missed, Lazzeri tied Joe Judge for third place in Most Valuable Player voting, with the award being won by Mickey Cochrane. Before the 1923 season, Lazzeri married Maye Janes. The couple had one child, David Anthony Lazzeri (1931-2013). Lazzeri died in 1946 at age 42 from a fall that the coroner said was caused by a heart attack in his Millbrae, California, home. He was elected to the Baseball Hall of Fame in 1991 by the Veteran's Committee. Many believe Lazzeri's fall was actually caused by an epileptic seizure rather than a heart attack. Although his offensive production was overshadowed by the historic accomplishments of teammates such as Babe Ruth, Lou Gehrig and Joe DiMaggio, Lazzeri is still considered one of the top hitting second basemen of his era. Koenig considered Lazzeri the team's most valuable player. He finished his career with a .292 batting average, 986 runs, 178 home runs, 1,191 RBIs and 148 stolen bases. Despite his hitting 60 home runs in an extended PCL season in 1925, Lazzeri never hit more than 18 home runs in a major league season (a mark he reached four times). Lazzeri holds the American League record for most RBI in a game with 11, set May 24, 1936, as he also became the first major league player to hit two grand slams in one game. He holds the major league record of 15 RBIs in consecutive games (one more than Rudy York in 1946 and Sammy Sosa in 2002). He also set major league records of six home runs in three consecutive games, and seven in four consecutive games. Lazzeri continues to share the consecutive-game American League record, but the three-game record was topped by Shawn Green of the Dodgers (seven in 2002) and the four-game mark was broken by Ralph Kiner of the Pittsburgh Pirates (eight in 1947). Lazzeri is also the only player in major league baseball to hit a natural cycle with the final home run being a grand slam on June 3, 1932. ^ "Hitting for the Cycle Records by Baseball Almanac". Baseball-almanac.com. Retrieved August 28, 2012. ^ a b c d e f g h i j k l m n o p q r Glueckstein, Fred. "Tony Lazzeri". Society of American Baseball Research. Retrieved August 28, 2012. ^ "Los Angeles Dodgers prospect Joc Pederson joins Pacific Coast League 30/30 club for Albuquerque Isotopes | MiLB.com News | The Official Site of Minor League Baseball". milb.com. Retrieved September 6, 2014. ^ "1928 Awards Voting". Baseball-Reference.com. Retrieved August 28, 2012. ^ "Proquest – Courant.com". Pqasb.pqarchiver.com. August 21, 1939. Retrieved September 10, 2012. ^ "Proquest – Courant.com". Pqasb.pqarchiver.com. December 5, 1940. Retrieved September 10, 2012. ^ "Proquest – Courant.com". Pqasb.pqarchiver.com. May 1, 1943. Retrieved August 28, 2012. ^ "Proquest – Courant.com". Pqasb.pqarchiver.com. January 11, 1944. Retrieved September 10, 2012. Glueckstein, Fred. "Tony Lazzeri". SABR. This page was last edited on 3 January 2019, at 23:09 (UTC).